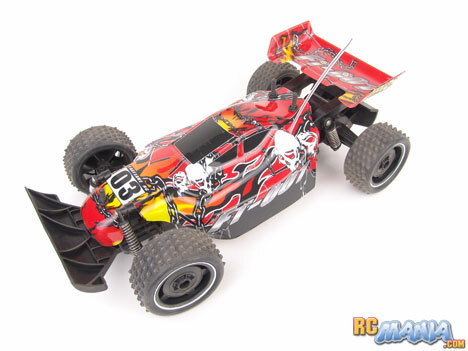 Fast Lane's RCs have been hit-or-miss on quality and performance, and this FT-001 buggy looks ominously similar to the terrible AJ-058, only larger at almost 16" bumper to bumper. Thankfully the FT-001 uses (and actually includes in the box) a proper 9.6V rechargable battery, so there's a good chance that this one will have enough power to get out of its own way. Outwardly, though, it's another sleek, aggressive-looking offroader with a lightweight chassis and thin, lightweight body. It clearly takes a lot of styling inspiration from hobby-grade RCs. It has independent front swingarm suspension, but a solid rear axle. The tires have a pin spike tread, but the material they're made of is excessively hard & stiff, which doesn't bode well for traction. Well, I think it's time to dig in and see what the FT-001 is really made of. My very first test run of the Fast Lane RC FT-001 was in my kitchen, which has a linoleum floor. When I squeezed the throttle trigger on the pistol-grip controller, the motor sprang to life, but the car barely moved at all. This wasn't a lack of power, it was a complete lack of traction. On a hard indoor floor surface, all of those rigid tire spikes just slip & slide, making the car completely undriveable. It did just fine on short carpet, though. Next I took it out to a park with a friend for some driving on common outdoor surfaces. Immediately I had a problem with one side of the body rubbing on one of the tires and getting stuck. You'll see it in the video. As it turns out, the body just wasn't cut back far enough to clear the tires when they turn, so I had to bend part of it out of the way (an easy and harmless fix with the thin Lexan plastic body). On smooth asphalt, the buggy had no traction problems at all. It was just really slow. On dirt, the car was able to get over small bumps and climb slight inclines. Because it's so low to the ground, though, it got stuck very easily on even pretty small rocks. Again the hard tires were a problem, because even though the spikes are great at "biting" through loose surface dirt and down to the hard ground beneath, once there, they then slip easily, sometimes leaving the car spinning its rear tires in place. The one really good thing about the car? It lasts a solid 20 minutes of continuous running on one battery charge. Most of the time, kids drive their RCs on concrete and asphalt surfaces, and on either of those, the Fast Lane FT-001 does okay. Again, it's definitely slow, but probably the right speed for a child at the lowest end of the recommended age range, 6 or so years. I think a kid who's 8 or 9 might get a bit bored, and anyone of any age who tries to take this "off road" looking buggy actually off road would get really tired of walking up & rescuing it all the time. Then there's the matter of the price. At $50 USD, with a battery and charger included, the price would be ideal for this size of car, if it performed pretty nicely. It was just one year ago that Fast Lane RC sold the Nitro Power Racing Buggy for just a little more, and that one performed wonderfully! The FT-001, though, is just too slow, too boring, too incapable to justify the cost, in my opinion. I will give it a "just barely passing" grade because it does come with the battery, it is fast & capable enough for a kid of the minimum age listed on the box, and it can drive on inclined driveways and some dirt. It's at the absolute low end of acceptability, but I personally wouldn't recommend it.